In this post, we’re going to be looking at the benefits of investing in sturdy Pelican flight cases. Most travellers try to make do with the cheapest suitcase that they can find. However, I’m about to change your mind! In this modern age, as the world seems to be getting smaller (or rather, more accessible) by the day; travelling has become a popular pass-time. Whether it’s a weekend break abroad, two weeks in your favourite resort or several months backpacking through South-East Asia; we can’t seem to get enough of those air-miles! But far as we have come as a species (figuring out how to make a 175,000 lbs, metal machine fly across the world at 35,000 feet), we can’t seem to nail down a luggage loading method which doesn’t involve the relentless mistreatment of our belongings. Too often do I hear stories about people whose luggage arrives at the other end, beaten up, zips broken and half-caved-in. You shouldn’t have to worry about your luggage when you’re on the plane (flying is scary enough as it is)! And you certainly shouldn’t have to face the infuriating inconvenience of finding your toiletries have leaked all over your fresh clothes because of the carelessness of baggage handlers either. And yes, I appreciate that I might be sounding rather ignorant right about now. Of course, not all baggage handlers are careless with our property. However, it’s certainly not uncommon, is it? And I’d be surprised if there were any malice in it either. I’m sure not every baggage handler hate’s their job so much that they spend their days purposefully damaging people’s belongings. Instead, it’s likely down to the fact that they are under extreme pressure to move luggage from point A to point B in order to keep up with the demanding flow of air-traffic. In any case, it doesn’t negate the fact that we put our belongings at risk every time we check our luggage in and wave it goodbye. The Pelican™ slogan is: “You break it, we replace it…for life.” Which means that you’re only looking at a one-time investment. 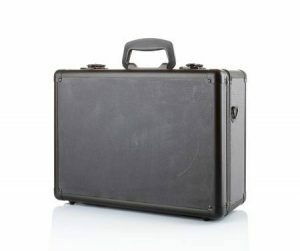 Yes, Pelican flight cases are far more expensive than your generic luggage, – however, they’re worth every penny. You won’t ever have to buy another flight-case again. If you’re anything like me, then your anxiety kicks in the moment your luggage leaves your side. With a sturdy Pelican flight case, you will never have to worry again. 4 – Easy to spot! When it comes to collecting your luggage, you’ll be able to spot your Pelican flight case almost immediately. They have a distinct and stylish look about them.